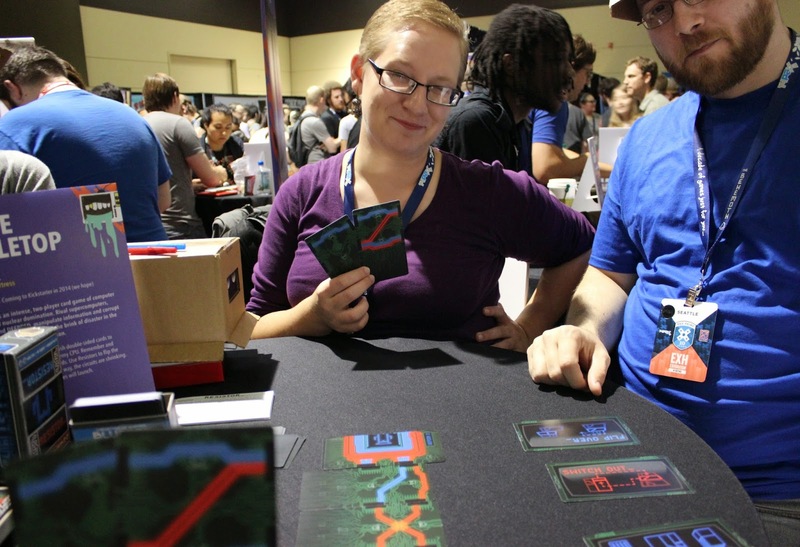 One of the first games we (Wesley H. and I) had a chance to play at PAX was an indie card game called RESISTOR_ (yes, the underscore is intentional) from Anthony Amato Jr. and Nicole Kline of Cardboard Fortress. You and your opponent are supercomputers, each one trying to dismantle the other's firewalls and disrupt their CPU. The implied finality is that with the other supercomputer out of the way, you are free to launch your nation's nuclear arsenal without fear of retaliation. RESISTOR_ uses the familiarity of a deck of cards and uses the space to create a unique and memorable game. There is something incredibly appropriate in starting a gaming festival with a game involving nuclear war. I'm not an advocate of mass destruction, not at all. Rather, it hearkens to an earlier time in my life; when the term "cold war" was nothing more than a plot device for a films starring Matthew Broderick. The basic premise is simple. Each player lays their CPU on the table with all it's firewalls intact. Between the two, a path is laid out with six cards, connecting the nodes on either end to form a weird, disjointed tangle of red and blue lines. Using their hand of two cards, each player must take three actions on their turn and attempt to create an unbroken line to the opponent and disable one of the firewall. From there, RESISTOR_ gets a little more complex. Every card is double sided. Part of the game requires you to only look at one side of the cards you have in your hand or on the board. Your opponent can see what's on the back of your cards and vice versa, but they can also use those cards during their turn. On top of that, each player has to take all three actions on their turn, even if one isn't advantageous to their position. You may like the way the board looks after you've discarded and switched out a card, but you still have to flip one over before the turn is over. My victory is almost secure, though I think my opponent (Fellow Contributor, Wesley Hammond) suspects something. The game becomes a dizzying memory puzzle as you try to remember what the other side of each card is as you flip and switch them around. Whoever has a complete line at the end of any turn scores a point, so it's possible to end up giving a point to your opponent at the end of your own turn. 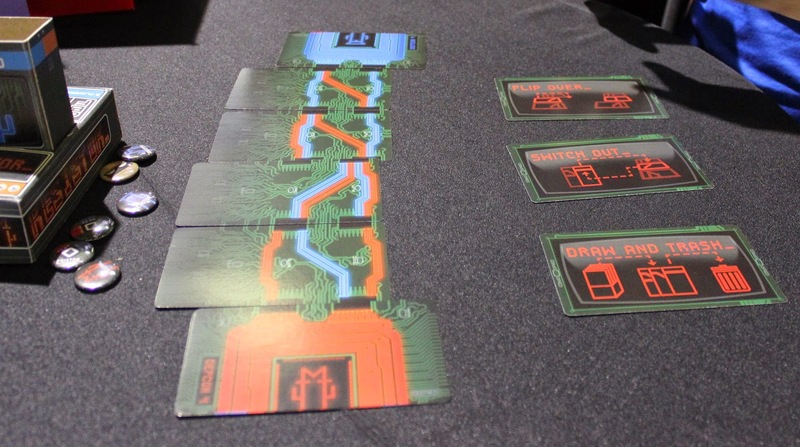 If someone reveals a resistor, it flips every other card on the table and heals whoever it has a clear line to before burning out and removing the card from the game, shortening the gap between the players. Though there is no time limit to the turns in RESISTOR_, the chaotic strategy sets a frenetic pace to the game. Our game was over in about 15 minutes or so, but the game length can be altered by reducing or increasing the number of cards laid between the CPUs at setup. If you'd like to get your hands on RESISTOR_, you'll have to wait for now. The game is still in development, with a Kickstarter coming in the near future. We'd like to thank Anthony and Nicole for their time and enthusiasm at PAX. They've created a fun and frantic game that I can't wait to play again. I'll be keeping an eye on RESISTOR_, so expect an update when the Kickstarter drops.